This Atomos Ninja V 5" 4K Recording Monitor with 500GB Sony AtomX SSDmini Kit put together by B&H consists of everything you need to record HD video to an external SSD. 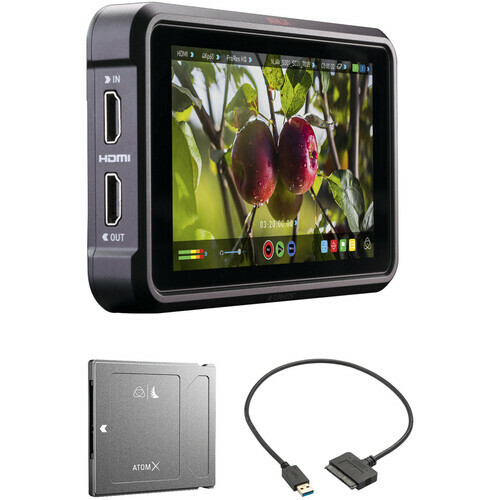 The kit includes a 5" Atomos V recording monitor, two L-series batteries, a battery charger with AC adapter, a 500GB Sony AtomX SSDmini, and a USB to SATA III connector cable. The 1920 x 1080 display features 1000 cd/m² brightness and a 10-stop dynamic range, supports popular log formats, records and plays back up to DCI 4K video, and includes an HDMI input and output. The Ninja V can record video up to DCI 4K onto the included AtomX 500GB SSDmini using the USB to SATA III adapter cable. The included power kit provides two L-series batteries with a charger to power your Ninja V.
This 500GB Sony AtomX SSDmini is designed specifically for the Atomos Ninja V recorder, but it works with most Atomos recorders (some recorders require an optional adapter). It supports sequential write speeds up to 500 MB/s and sequential read speeds up to 550 MB/s. 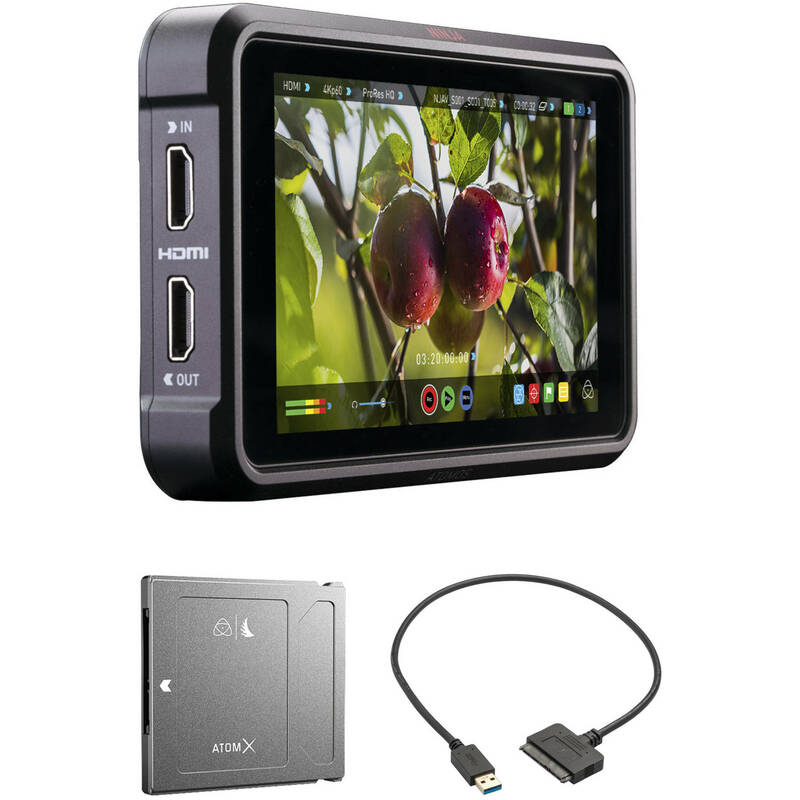 The high write speed enables it to capture high-quality 4K footage in any of Atomos' codecs without dropping frames. and the read speed makes for fast offloading of material and smooth playback with no dropped frames. The housing of the SSDmini is 20% shorter than conventional SSDs as per the Atomos design, allowing it to work seamlessly with Ninja V recording monitors. The solid-state design of this SSD can provide up to 1500 G/0.5 ms of shock resistance. Access internal 2.5" drives from a USB-enabled computer with the USB 3.0 to 2.5" SATA III Hard Drive Adapter Cable from StarTech. This adapter sports a SATA interface that is compatible with SATA I, II, and III-based hard drives and SSDs. On the other end, it has a typical USB type-A connector that utilizes USB 3.0 technology, which delivers speeds of up to 5 Gbps. It draws power from a USB bus-powered port. In addition, UASP enhances the transfer speeds when the adapter is connected to a UASP-enabled host controller. UASP is supported in Windows 8, Mac OS X (10.8 or above), and Linux. In testing, UASP performs with a 70% faster read speed and 40% faster write speed over traditional USB 3.0 at peak performance. It also shows an 80% reduction in required processor resources. Box Dimensions (LxWxH) 5.8 x 4.4 x 4.1"
Box Dimensions (LxWxH) 9.0 x 8.0 x 0.25"
Ninja V 5" 4K Recording Monitor with 500GB Sony AtomX SSDmini Kit is rated 3.6 out of 5 by 27. Rated 5 out of 5 by Edward from Right-Sized Monitor/Recorder The Ninja V is my second recorder, the first being a 7" Ninja Inferno. I shoot a lot of location video, and recording low-compression video is a huge boost in image quality. More important, I can shoot with a Sony A9 or A7Riii without the phony 29 minute clip limit. Even with lower brightness, the V is easily visible outdoors, without a hood. How did I ever do without one. The Ninja V does not come with the handy carrying case like the 7" versions. I find that a Lowepro Dashpoint AVC2 semi-rigid zipper case is the ideal size for the Ninja V, a couple of batteries and cables. Running mobile, everything needs a secure way to carry the essentials. Rated 4 out of 5 by Anonymous from Small, robust, but a little noisey Just got my Ninja V, and the solid metal frame feels strong and sturdy, nice bright, and hi res screen and UI, but I'd say you'd get a few sound recordists looking at you when shooting in small/quiet rooms in interview type situations, as the fan runs constantly, and you can't turn it off as far as I can figure out, it's not super loud, but it's noticeable. It can fit standard 2.5 SSD's with the supplied caddy easy enough if you don't want to fork out more for mini SSDs, it just pokes out the side about an inch. Rated 2 out of 5 by Domagoj from Unfinished product 1. Unlike Ninja Blade, Ninja V wont recognize signal from Canon 5DmkIV and make 2:2 pulldown automatically (I shoot PAL1080p25). Even when you set it up manually (which is time consuming), after powering off, Ninja V it resets and you have to do it again. I dont have time for this flaw. Its just waste of my time. 2. Atomos calibration is not working. 3. No Manual! Screen is great but software is unfinished. I expect from my gear not to slow me down and Ninja V is just doing that. I make mistakes because of it. Rated 2 out of 5 by Francisco from Sound recording is bad I was very pleased with the monitor itself, but found out my unit records audio with a weird buzz/interference in the background. I tried different microphones, and the same issue persisted. Also, the "remote" port is twisted as though it wasn't properly placed/assembled during manufacturing. I'm returning my Atomos Ninja V hoping to get another one that doesn't have this sound problem/ twisted port. Rated 5 out of 5 by James from A Must Have The size is perfect for run & gun. It works as advertised. Be advised that the coiled HDMI cable advertised with this unit will not support 60P. You have to purchase the more expensive cable on another page with the Atomos logo on the plugs for 60P to work. Rated 5 out of 5 by Joshua from Small, lightweight, and with great visibility outdoors! This is my first monitor ever and I am glad I waited for the 5 version. The screen is plenty big enough for composing my shots and making sure I am properly focused. The monitor does an amazing job when shooting in any log profile by giving you an accurate simulation of it in rec.709 allowing you to properly expose in high dynamic environments. ProRes and DnxHR are amazing codecs with minimal compression allowing you to push grading even farther. I totally recommend the ninja v.
Rated 2 out of 5 by Joshua from Lots of Color Noise in the Blacks I shoot TV Series and we wanted to add this to our other Recorders but with a smaller setup. Shooting on Canon Log, the Ninja V on Prores has a lot of noise in the blacks. Weve had to use de-noise software on every shot so far that has any low light or shadow environment. Upon use theres lots of horizontal color banding noise throughout. We contacted Atomos and have not heard back. And additionally weve watched the video by the CEO where he talks about how to avoid noise in the blacks. Simply put, footage is much worse than the 4:2:0 footage captured in the camera or on our other Atomos 4:2:2 recorders. Rated 1 out of 5 by Stan from After one day this thing stinks First, I have a Ninja Flame which works well with my Panasonic DVX200. The Ninja V doesn't come with any documentation, but that's okay because there are quite a few videos available online, including one showing how to connect the DVX200 with the Flame. The Atomos web site also shows that the DVX200 is supported by the Ninja V. However, the Ninja V does not recognize the DVX200, does not accept the DVX200 record setup (yes, I used the work around that I used for the Ninja Flame), and doesn't recognize the Luts that I've loaded. As the headline says, this thing stinks. I will rewrite this review if Atomos corrects the problem or if a solution is ever published. How many hours of recording time is 500 gb with 4k @ 24 or 30 fps and 1080 @ 24 or 30 fps? Hello Victoria, this is a ProRes or DNx white paper answer but general rule of thumb is about 100 GB per hour in HD and 400GB in 4K. The Canon T3i does not have a clean HDMI output. Unfortunately you will not be able to use that camera with this recording monitor, or any other like it. Does this come with a case of any kind? Hello Iljah, it does not, however we just announced the NINJA V accessories kit. Using the Atoms Ninja V, can I record longer than 30 minutes with 4k on a Sony A7III? Yes you can. You will be able to record for as long as the Hard Drive and setting you select allows you to record with the Ninja V. You are not limited to 30 minutes with this recording monitor. Can I use it with Fujifilm Xh1 to record 60p 4K 10bit 422? What about Fujifilm Xt2? You will be able to use the Ninja V with both cameras. However those cameras only output 4K at up to 30fps and 8-Bit 4:2:2. The camera most output at 60fps and 10-Bit for it to be recorded in that format, which those cameras do not. Will the Ninja V work with the Nikon D850 ? Yes. That is correct. You can mount a Atomos Ninja V 5&quot; 4K HDMI Recording Monitor on a Nikon D850. All resolutions and frame rates will come over and be recorded. It does. And, in the very near future, it will support ProRes RAW from the Z6. This will come in a firmware update from Atomos. Is this compatible with the Canon 80D ? Hi. The short answer is no. There's a couple of things to consider with you want to pair with with a 80D. One, does the 80D have a &quot;clean&quot; output? You can test this on your TV and diving in the camera menu. The manual gives no information about it. A &quot;clean&quot; output means none of the settings are displayed on the HDMI output. Without a &quot;clean&quot; output, your footage will not be usable for editing. Second, the HDMI output on the 80D is likely 1080p/24, please verify. The Ninja V is a 4k/60 recorder. So you're paying for features you won't use. I hope that helps.